Imogen's Typewriter. 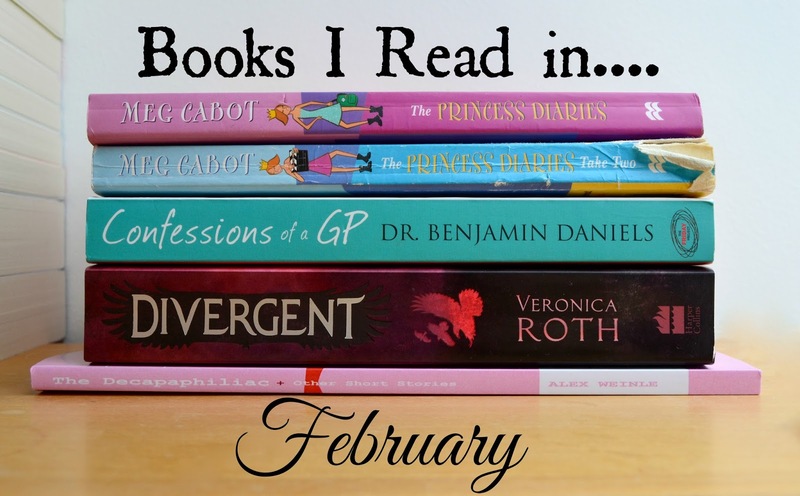 : Fiction Friday: Books I Read in February! February was a month of reading things which as a whole cannot be categorised together. I didn't want anything too tough as I'm still easing myself into reading more, I just wanted to re-read some of the books I read as a teen to see if I wanted to keep them for the future and some light comedy but then I took a break and came back to read a completely new- and disappointing YA book and a set of short stories that I won off Goodreads. Yeah, no sense can be made of it. The movie is great, I could watch that movie a thousand times and probably have. The book- is interesting. It's in a diary format which is rarely used in prose but also comes with problems. The main problem being the lack of time passing. This book only covers about a month, a dramatic month, but a month none the less and I missed the wide arc of character development within the everyday occurrences. But I did like these books a lot when I was younger so maybe I'm just getting too old for them! This is more of the same from the first book, plus the inclusion of a pregnancy and a secret admirer. It's pretty dramatic stuff and it is fun to read but I can't think of anything that stuck. And there was the small matter of Mia's feelings for Michael from book one of liking his abs turning into omgIlovehim but hey, still better continuity then The Walking Dead. It also suffered from lack-of-time-passing but it was a dramatic month. My dad is a GP so this was a pretty funny read that was close to my heart. However, there were some bits- and a lot of people on Goodreads seem to agree where the writer was a bit callous about certain diagnoses and about female nurses and doctors. It kind of ruined the read for me a little bit because the rest of it was really funny and I guess if you're less sensitive about certain issues then this book could be four stars but it was a bit hit and miss for me. I was really excited about this book after reading and watching so many rave reviews. When I finished The Hunger Games which I adored, I googled around looking for something to fill the gap and this was widely seen as similar but different. Unfortunately, it just wasn't the same. I see the appeal- but I didn't enjoy it as much and I think it's because there wasn't as much world-building. I couldn't 'see' it as much as I could 'see' The Hunger Games world. However, I did read it in a day. So I'm confused at what my head and heart are telling me! This wasn't my usual type of book but the cover and the description caught my eye. It was a nice break from the YA series I've been reading lately and there were quite a few bits that made me smile as I read them. All in all, I would say this is a good book for people who don't have a huge amount of time to read, or have a short commute, and don't mind the more mature subject matter in some of the stories but it wasn't something I would read cover-to-cover again. I might dip in and out. Have you ever read any of these books? What did you think? And what did you read this month? *I won this from a Goodreads giveaway, I'm not obligated to talk about it on my blog, I just read it this month.